These are koi with either no scales at all (leather carp), or with a line of large scales along the lateral and dorsal lines (mirror carp). There is a Doitsu version for almost all the koi varieties: Doitsu Kohaku, Doitsu Sanke, Doitsu Showa, Doitsu Kujaku, Doitsu Ogon, etc. 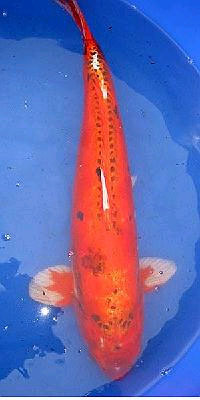 So basically any koi can be part of this group, as long as they have the “Doitsu-type” scalation. 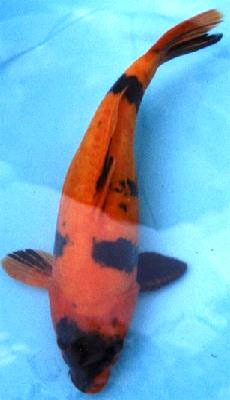 Doitsu: Mirrored scaled koi... with enlarged rows of scales along the midline of the back and/or the sides of the fish. The derivation of this name is from the Japanese/Nijongo for "Deutsch", for German scaled carp... initially bred for ease in scaling/preparing the fish for human consumption. Varieties are Kohaku, Sanke and Showa. 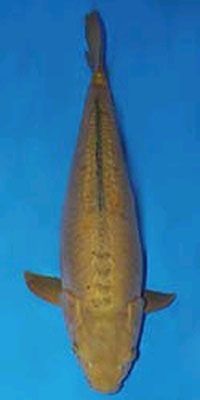 Doitsu are Japanese koi crossbred to display the characteristics of the German “leather” carp with no scales at all or with the German “mirror” carp having large scales only along both sides of the dorsal fin or with large scales along the dorsal fin and also along the lateral line on both sides of the koi. 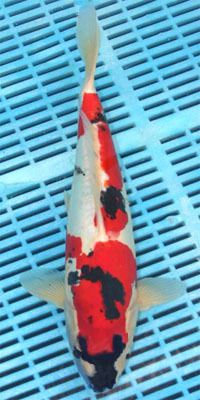 Doitsu koi have been crossbred in Japan for most all of the classes and typically compete against scaled Japanese koi in the same class unless there is a special Doitsu class. 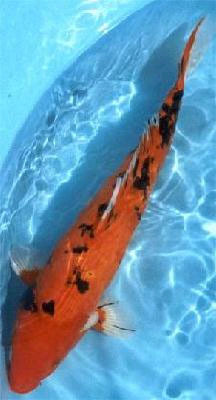 Doitsu koi can easily have sharp kiwa due to not having scales so scaled koi are given the difficulty advantage in judging. All judging points being equal, scaled koi will beat Doitsu koi.